On Monday, 73 security personnel were ambushed and killed by Maoists in the jungle of Dhantewada. I am sure this must have brought a contended smile on the face of Ms. Roy. Ms. Roy, (for those of you who do not know who) is an intellectual. She is above us mortals, and her logic is not to be understood by us. Her enemies are the state of India, the US of A, the large corporations, HInduism, the common man, and many others whom she will gradually discover. She has won the Booker prize and written numerous essays and so that by default makes everything she says true. Ms. Roy has a surprising number of followers in India. Most of them belong to the middle/upper class. They are well educated and are aware of situations around them. 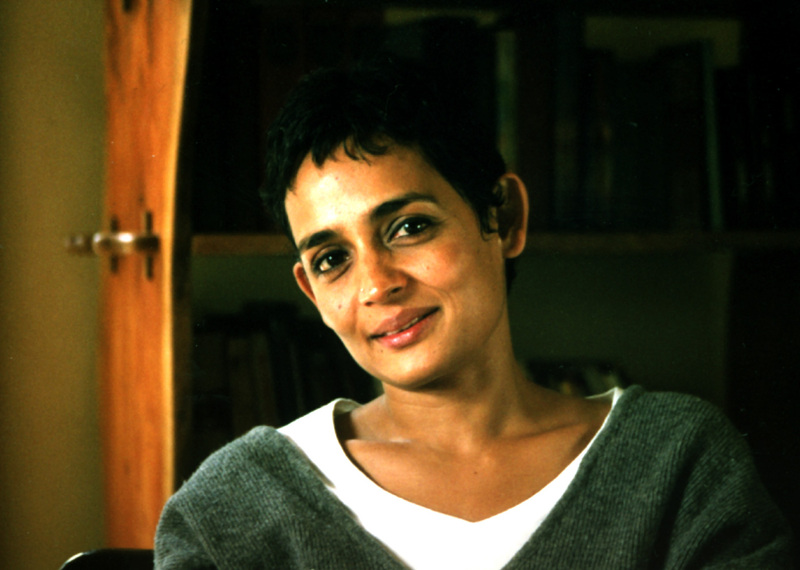 Arundhati Roy is their pagan Goddess. It is, after all, cool to quote her. Such disciples can be found debating on a variety of topics, ranging from atrocities of the USA, to the injustice meted out to the tribal populations, or, ‘tribals’ (as they put it, with full sensitivity, of course). Imagine walking into a room of lesser mortals with your kurta and khadi bag, and talking about the injustice of the capitalist world. Isn’t that the coolest thing? It sure is. Some would argue that Ms. Roy is a fundamentalist. But surely, she cannot be one? She has won a Booker prize. She wants Kashmir to be a separate state. And she thinks that Mohd. Afzal is just a spoilt brat who in one of his childish pranks, ordered his comrades to attack the Parliament. It is ghastly that the government tried to hang him. Oh, and yeah, she and her husband own a posh 4,346 sq. ft bungalow in Panchmarhi, which violate forest laws. But she is not God, is she? She is only human. And a very intellectual human. For Ms. Roy’s followers, wearing a Nike shirt is a vulgar endorsement of capitalism, and buying a kurta from Fab India for Rs. 554 is alright. “It is made by Indian weavers. I do not mind paying a high price for it.” Such patriotism! Ms. Roy and her band of intellectuals have been staunch supporters of the Naxal movement and endorse the right of the tribal people to use violence as a means. “Who is going to listen to them? What about the injustice meted out to them? What about those who cannot speak out like you and me?” Point well noted. The security personnel are not human beings. There has been no injustice done to them. They have been slaughtered and shot at, but surely that can’t be injustice? For, they do not have families, and they earn salaries as high as 12,000 a month. They are a privileged lot. So let us not speak about them. The Maoists have said that they want to ‘take over’ the country by 2050. I am sure they mean it in a good way. Blow up a few police stations here and there, damage a few schools, recruit some young teenagers into their ranks. Nothing very serious. Of course, then there is the spreading of chaos in the administration. And as a means of connecting with the common man, they would stop trains and lay a few friendly bombs here and there. You know, just regular ‘Hi-Bye’. The Maoists are the answer to the problem faced by the tribal people. Construction of buildings of any kind is again a sign of globalisation. There should be no buildings at all. The Maoist areas are run on the simple principle of brotherhood of man. As a result, there are no police stations in these areas. There are no hospitals as well. Government hospitals and dispensaries are regularly blown up, as they propagate something as sinister as free medical facilities for all. There are no schools in these areas as well. Children do not need to study. Whie their counterparts across the country are whiling away their time learning about World Wars and the Freedom Movement, the children in these areas are actually contributing towards such issues. They are recruited in the ranks and wield guns. They lay their lives down for their land. They are not children, they are martyrs. We are talking of generations of injustice towards the tribal people here. None of the Maoist areas have such unnecessary side-effects of globalisation as schools, hospitals and police stations. Roads are another unnecessary expense that the government is incurring. Not needed. Our intellectual brothers also remind us time and again of the atrocities of the Government towards the tribal people. Tribal people are the same as the Maoists, not to be confused as two different people. It is the tribal people who are trained in guns, run drills, and plant landmines. It is the tribal people who are fighting their war, and they are not being instigated by Maoists. They are one and the same. These intellectuals are also the only people aware of the skewed R&R policies of the government. Of course, wearing chappals and kurtas entitles them to a greater understanding of such issues, issues which the common man has absolutely no idea about. None of us, the common men, are aware that there has been injustice meted out to them, we are not concerned. We do not care about them. We are lost in our own world, mere spokes in the vicious cycle of globalisation-development and injustice that is going on. They have been historically sinned against, something that none of us admit or acknowledge, cruel and myopic as we are. This fact is to be hammered into our brains till we turn into intellectuals ourselves. What is the way forward? How do we resolve the issue from here on? That is not important. It is important that no force is used against the Maoists. They have suffered so much, it is only humane to give them time and space to express their angst. Evil conspiracies like laying down their arms and dialogues across the tables are for the mediocre. Ideologies as rich as the Maoists need not succumb to these. There is no point in looking at the future. There is no point in trying to find a solution. Letting them be is the only way the tribal populations can have a better life. The Maoists have plans and social schemes that can ensure that the tribal people are ensured of their land, their rights, and to a better socio-economic status. There is an agenda for social well-being, yes. It hasn’t been implemented in any of the areas as of yet (the movement has only been in effect for the last 30 years. Revolution is a lengthy process). So, there is not a single area that is run by the Maoists where the tribal people lead lives of economic independance and well-being. But those days are not far away. Utopia will arrive in 2050. When the Maoists will ‘take over’ the country. Only then, my friends, will we be an intellectual country. Till then, take homage in the knowledge of Ms. Roy. There is hope for salvation. This entry was posted in Politics on April 8, 2010 by . Hi, I’ve just started reading your blog and I like it. But I realize that when it comes to radicals such as islamic or maoist you have little understanding of issues. You speak from a shallow standpoint. Everywhere human beings want the same things. They want to live, they want to work, they want their children to do well. Sometimes people are at the receiving end of so much atrocity and injustice that cornered, they take to arms. And then there’s no looking back. The violence has to spend itself out over time and before it does it takes on a life of its own – so much that people like you can forget how it all started. This is true for radicals anywhere in the world. As for islamic terrorists, so for our own Maoists. We drove them to violence and we need to understand that. The govt of India outlawed them when they’ve been asking to talk. The Congress govt. spoke of invoking the army against them – our own countrymen! Is this how you would settle a domestic conflict in your family? Thrash the dissenter? They sent a 100 police personnel without schooling or information into Maoist terrain and most of them died. What are you outraged about? If you weren’t outraged by what drove these tribal people to arms in the first place, you have no business being outraged now. If you are unaware of history, of the larger context, then go and read first, before you talk.